The Diamond Residences exist as part of the Elounda Peninsula and Porto Elounda Resort complex in Elounda municipality, Lasithi Prefecture, Crete, Greece. The complex is a fenced private plot, within which all the amenities and facilities exist. The owner of the plot and the resort is Elounda S.A., a Greek company owned by the Spyros and Eliana Kokotos family. The residences are offered to owners under a 60 year renewable leasehold, governed by the timeshare law of Greece, which allows for notarial leasheolds to be executed, and allowing for the declaration of such ownership in the local land registry. Thus, these leasehold deeds are saleable, inheritable, pledgeable (for mortgage purposes) etc. Furthermore, the owner of the resort is not permitted to put liens on the units sold under these contracts, so they are free of such burdens. There is no exclusion of buyers based on nationality; non-EU citizens will have to obtain clearance to sign the final deed, which normally takes a few months. The execution of the lease and assumption of leasehold deed does not create a taxable event by itself (as opposed to a freehold deed sale/purchase, which involves significant transfer taxes). Annual property taxes are levied on the resort as a whole, and paid by the resort owner, not individually by each leaseholder. Taxation of income will apply on income generated should the leasehold owner use the unit for income generation. The owners will have the option to exchange their leasehold deeds with freehold titles when and as the Greek law allows, without additional payment to Elounda S.A., but being responsible for any taxes arising therefrom and any transaction and documentation costs. The leasehold contracts are signed in the presence of the notary, and buyers are advised to have Greek legal advisors to assist them in the process. The cost of the notary is borne by buyers (lessees) of residences. » first, a private agreement or reservation agreement is executed between the buyer and Elounda S.A., with a deposit paid against the purchase price, with a validity of no more than 60 days to study the full contract form, legal and tax issues, eventual ownership structure, interiors, etc. The deposit can be refundable in kind in case the buyer opts not to proceed, i.e. 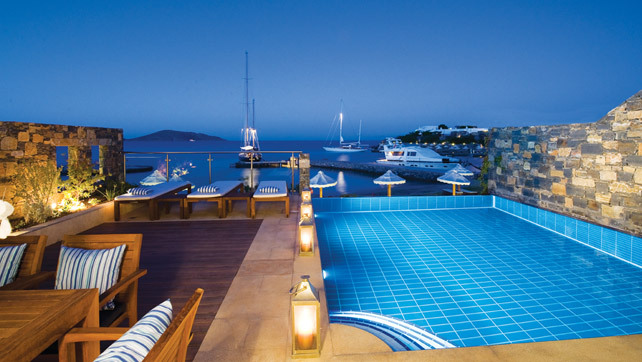 given as credit for hotel stays in any of the Elounda S.A. properties. » third, when the unit is completely finished and delivered turn-key, and owner has obtained any border clearance if necessary, the final deed is signed in front of the notary and the final payment is made.